Once here, please enter the ISBN and click 'search'. The content will then be available to download. Jens O. Andreasen, University Hospital (Rigshospitalet), Copenhagen, Denmark. Leif K. Bakland, Loma Linda University, California, US. Maria Teresa Flores, Faculty of Dentistry, University of Valparaiso, Chile. Frances M. Andreasen, University Hospital (Rigshospitalet), Copenhagen, Denmark. Lars Andersson, Kuwait University, Safat, Kuwait. Epidemiology of Traumatic Dental Injuries. Pathophysiology and Consequences of Dental Trauma. Diagnosis of Pulpal Healing Complications. Diagnosis of Periodontal Healing Complications. Treatment Priorities after Dental Trauma. Crown Fracture without Pulp Exposure. Crown Fracture with Pulp Exposure. Injuries to the Primary Dentition. Decoronation of Ankylosed Teeth in Adolescents. Tooth Survival in the Permanent Dentition. Information for the Patient about Dental Trauma. Information for the Public about Dental Trauma. Prevention of Traumatic Dental Injuries. 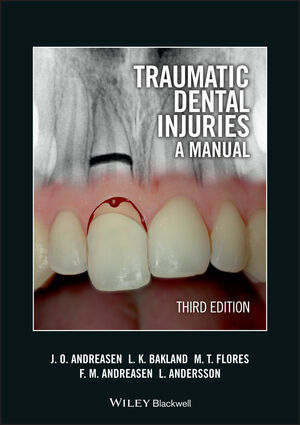 Accompanying DVD, links on online dental trauma database, update of all chapters, additional new chapters.